Was Las Vegas Fast And Furious On Steroids, A Massive Gun Running Scheme Gone Wrong? Was Las Vegas Massacre 'Fast And Furious' On Steroids, A Massive Gun Running Scheme Gone Terribly Wrong? 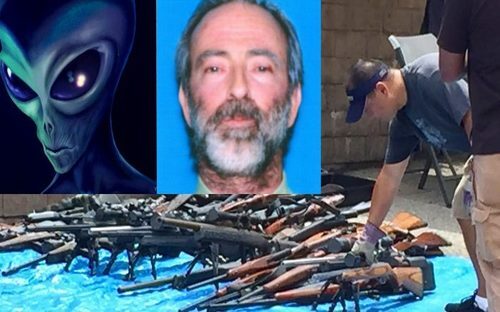 For those who've forgotten the story of a 'mystery man' who was found dead back in 2015 in a Los Angeles, California neighborhood, leading authorities to discover 1,200+ guns and 7+ tons of ammunition, now is the time to remind you. While the man known only as 'Bob' to his friends and fiance was finally officially identified as one Jeffrey Alan Lash, authorities said he led a 'double' or 'secretive life', and told friends he had worked for a top secret government agency before 'going out on his own'. Despite living with his ex-fiance for 17 years in which she had no clue about what he really did while he collected so many weapons they piled up to the ceiling, as we see in the first video below, a 2015 CNN report about the mysterious stockpile of weapons, Lash also compiled a huge pile of cash during that time while bragging about saving America from numerous terror attacks. While Lash lived in a house worth nearly a million dollars and had compiled weaponry and ammo worth well over a million, police said there is no record that he ever filed a tax return or held a job. Interestingly, according to this story from Live Trading News about Lash's death, after he died, his fiance and another woman left his body in a car and fled to Oregon because they believed Lash was an ET-human hybrid working for US intelligence agencies, and that his contacts would soon retrieve the body. A photograph of Jeffrey Lash and some of the weapons found in his home taken from the Live Trading story is below. While we'd truly hoped we'd be done writing about such a horrific tragedy as the Las Vegas shootings by now, new information continues to flow in a half-a-week after the cowardly attack and as we've noticed in the ANP comment sections and all across the internet, the more new information that surfaces, the more people want to get to the bottom of what really happened there. And like Jeffrey Lash, authorities say that the Las Vegas shooter also led a mysterious, double life. With more and more videos coming out that appear to document the 'multiple shooter' theory while Las Vegas Sheriff Joseph Lombardo claims its likely that at somewhere along the line, Stephen Paddock probably had some help, we take a look within this ANP story at an emerging theory that continues to pile up evidence - Stephen Paddock may have been an arms dealer working for a shadowy 'deep state' US government agency. Along with taking a look at several emerging warnings that he may have been selling weapons to ISIS terrorists within the United States. Jim Murren of MGM Resorts International has violated the trust of his MGM Board, shareholders, employees and customers. But not in a small way. In a “Vegas bigger-than-life way." Murren is so wildly wrong, so spectacularly reckless, so disastrously offensive to his customers, I believe it’s time for a shareholder revolt. No CEO has a right to involve his company in controversial politics, let alone the funding of extreme and radical organizations. But Jim Murren wins the award for "Reckless CEO of the Century." Murren has just put MGM in bed with an organization with ties to Islamic terrorism. Does MGM's Board approve of their CEO using company statements and shareholder money to offend 63 million Trump voters? How about every conservative in America? How about Christian customers? Families with children? How about anyone who is not a fan of Hamas or the Muslim Brotherhood? Because I am certain millions of MGM customers will be shocked and offended when they find out who Jim Murren just tied his company to. Murren announced in response to what he sees as the racism, bigotry, intolerance and violence seen at the Charlottesville disturbance, that MGM will donate company money (and match employee contributions) to a collection of extreme leftist civil rights, human rights, and Muslim advocacy groups. A strange and partisan decision to make with company funds and shareholder money. Is it just a coincidence that one of the greatest mass shooting in US history happened at a location where the CEO had just sold out America while selling away his soul and his company to the Muslim Brotherhood and 'resistance enemies' of President Trump? While Americans may never learn the 'whole truth and nothing but the truth' about what happened in Las Vegas, we can learn a lot by watching the direction that the mainstream media attempts to steer us, especially knowing that the msm was 'all in' for Hillary Clinton and was clearly eating out of the hand of Barack Obama for 8 years and has long been the megaphone of the 'deep state'. Besides, the msm has never questioned the possible 'false flags' that have happened in America. Was what happened in Las Vegas 'Fast and Furious' on steroids, an arms deal that went out of control or worse? For those who'd discount the idea, please remember that we have 100% documented proof of the federal operation that allowed weapons from the U.S. to pass into the hands of suspected gun smugglers so the arms could be traced to the higher echelons of Mexican drug cartels. 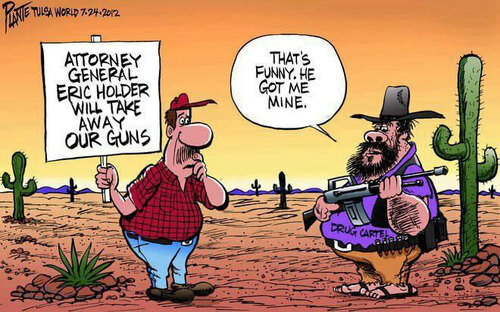 The Bureau of Alcohol, Tobacco, Firearms and Explosives, which had run the operation during the Obama administration, ended up losing track of hundreds of firearms, many of which were linked to crimes, including the fatal shooting of Border Patrol Agent Brian Terry in December 2010. That's right, while Barack Obama, Hillary Clinton and Eric Holder were scheming on how to take the 2nd Amendment away from Americans, they were arming Mexican drug cartels and mass murderers. What could go wrong? While President Trump recently officially put an end to the US government arming of ISIS, have 'shadowy agencies within' just 'gone dark' with their selling of weapons to terrorists? 'Fast and Furious' proves that if they did it once, they'll do it again and remember, Barack Obama 'switched sides on the war on terror'. We've long warned on ANP of the countless number of 'trojan horse terrorists' that were likely allowed into the US during Obama's 8 years of open borders. 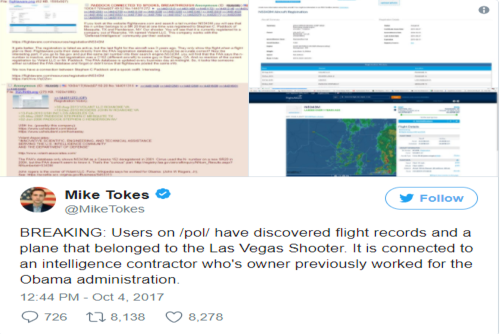 Looking closely, the first thing you will notice is that the shooter, Stephen Paddock, had a pilot license and owned two planes. This is well-established fact. The tail number of one of those planes is N5343M, a Cirrus SR-20. You can see that this was owned by Paddock by going to the website Flightaware.com. But Paddock doesn’t own this plane anymore. It was grounded three years ago, and it’s now in the hands of none other than Volant LLC, which there is little information on. However, Volant Associates is none other than a Department of Defense contractor. Meaning Paddock’s plane has been in the hands of the United States government for the past three years and grounded since – if Volant LLC is being used as a way to hide information. Considering what Volant Associates does, that wouldn’t be so far fetched. But the plane’s information is all easily verified here on Flightaware.com. It’s been in Roanoke, Virginia since April 25, 2014. The registration of this plane is also listed as “active” even though it hasn’t been flown in three years. Strange enough yet? Well, it gets even better. The FAA should have this same information. But they don’t. 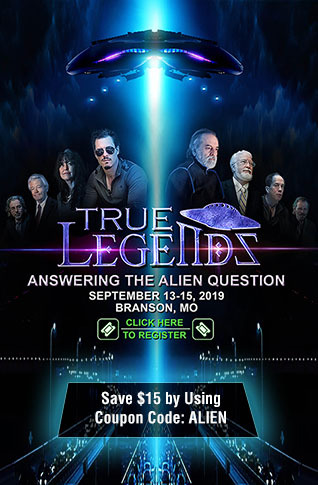 Their website shows that a different aircraft, a Cessna 152, maintains that tail number and it was last registered to a person in San Diego, California. The FAA (Federal Aviation Administration) is a government agency, and it appears that it has scrubbed this plane’s information. Now, why would they do that? Well, the plot still thickens. There is little to be known about Volant LLC., in Roanoke, Virginia. A company big enough to have a plane should have a website, at least that would be the assumption. But a Google search netted very little information other than they provide “business services.” But Volant Associates is a completely different matter. That’s your defense contractor. And their website says they are located in Chantilly, VA, which wouldn’t be too far from Volant LLC. in Roanoke. And a quick Google search of that verifies that the two cities are only 219 miles apart. So is Volant LLC., a cover company for the defense contractor? Is this a coincidence? For a list of all of the contracts between Volant LLC. and the government, click here. They have worked for the Obama Administration. Could Paddock’s plane have been used in other scandals, such as the Fast and Furious gun running scheme? Who knows, and at this point, we may never know. What all this means is entirely speculation right now. But isn’t is strange that this information is being kept from the public, and those who seek the truth are stuck finding it on their own? As Slavo goes on to point out, Stephen Paddock recently wired $100,000 to the Philippines, a country known for an increasingly growing ISIS threat and for an illegal arms trade that in 2014 led to the arrest of a Californian Senator. Thus, is it possible Eric Paddock meant to say, “Steve was an arms dealer,” prior to cutting himself off? The 'arms dealer' possibility doesn't end there. On the day after the shootings, an uncensored photograph was published on the Twitter account of an individual that goes by the name of VegasStrProphet showing the carnage on the field soon after the shooting. That horrific photograph didn't show up any place on the mainstream media until the next day when the Daily Mail published it, and then it was heavily censored. How did he get the picture long before anyone else? Well VegasStrProphet also put out another tweet containing information seen above in which he claims that according to leaked Las Vegas police department information, Stephen Pollack was supplying arms to ISIS inside the US and their deal went horribly wrong. 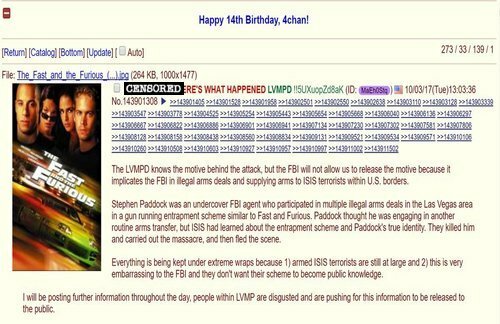 And while we completely understand why some information that comes from 4chan anonymous sources might not be considered to be the most credible, 4chan has also long been known as one of the BEST places for official sources to leak information. With speculation about the death of John F. Kennedy still continuing more than 50 years later, we can well imagine that Americans will continue to speculate about what really happened in Vegas for a long, long time, especially considering all of the emerging information that points to something much bigger than a 'lone nut' in Vegas. The FBI produced charts showing CAIR was created to support the Palestinian terrorist organization Hamas. CAIR advises Muslims not to cooperate with the FBI. Many CAIR officials and associates have been convicted on jihad terror charges. What CEO would tie his company to a group attached to Muslim terrorism? Any CEO would have to be blind, deaf, or dumb to go near CAIR. He’d have to know his controversial choices would offend, outrage or chase off millions of his customers by choosing groups so extreme. Jim Murren has gone way too far. He’s off the deep end. And he’s put MGM’s Board, shareholders and employees in a terrible position because of his extreme, radical, reckless decisions. And now we have what appears to be a terror attack in Las Vegas at the Mandalay Bay, where CEO Jim Murren had also recently sold off his MGM stocks in the weeks before the attack as casino stocks continue to fall since the horror there.